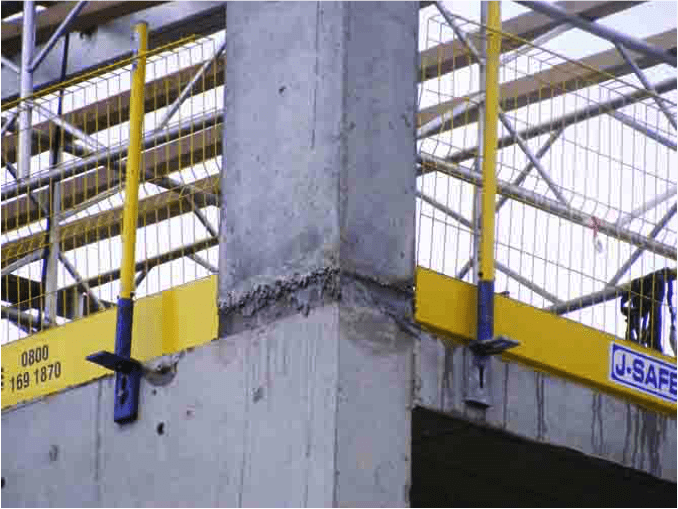 Protection areas to prevent falls from height on Falsework Structures, Top and Edge of Concrete slabs. 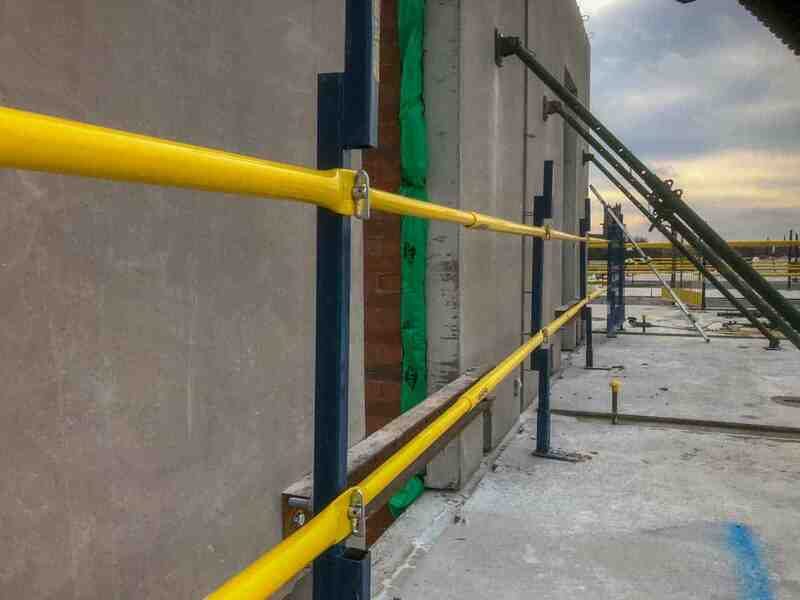 J-SAFE Connect is a systemised guardrail system that protects those exposed to falling from height when working on Temporary Structures or on suspended Concrete decks. It is designed to meet the requirements of EN 13374 Class A which defines a Temporary Edge Protection System as a set of components intended to protect people or objects falling to a lower level.,is easy to install. The principle component of the Connect System is the steel mesh barrier, which replaces traditional guardrails and toeboards. 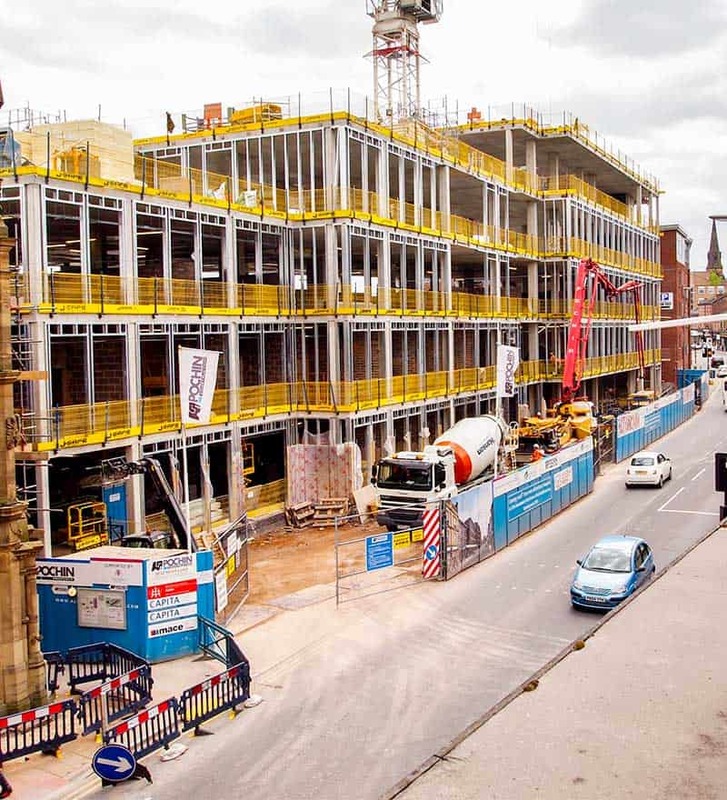 This is supported by posts and connecting components that anchor or clamp onto concrete slabs, formwork supports and systemised decking systems. The best position for the temporary edge protection system is determined by the type of facade that is to be fixed on the structure,on the edge a modular steel framing system can be installed behind the temporary edge protection if its installed on the outside edge of the slab, whereas as a full height facade panel that is connected to the outside of the structure will need edge protection positioned on top of slabs, in both cases facade installers are able to fulfil their work in a safe environment. This configuration of the J-SAFE CONNECT system positions the temporary edge protection system on top of the concrete deck. Suitable for insitu and pre-cast concrete frame offering ease and speed of installation comprising only Base Sockets, Posts and Barriers. Anchored into the concrete using a 12mm diameter reusable screw anchors. extended using Top extension barriers providing a guardrail height of 1800mm. European compliancy to EN 13374 Class A. Short lengths (nominally 200mm) of plastic duct are placed into the wet concrete during the deck pours ensuring that they are vertically aligned. If the Temporary Edge Protection system is to be moved between floors Excalibur screwbolts provide easy to use economical anchorages which can be re-used up to eight times. Temporary edge protection system’s are installed onto the edge of a concrete deck when the top of the slab needs to be clear for modular steel framing systems , Metsec or similar. 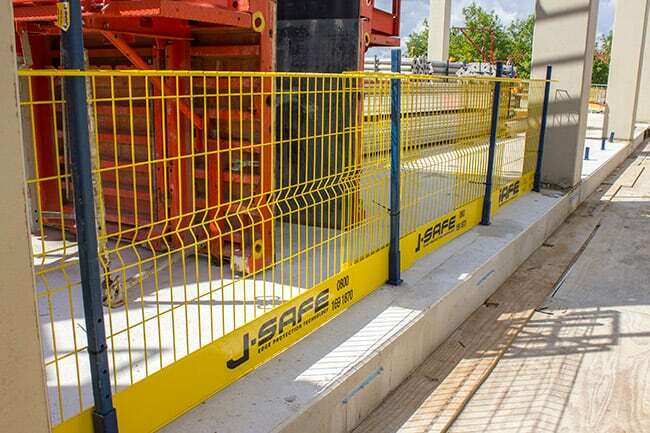 J-SAFE Connect is utilised using three principle components, Slab Edge Bracket, Post and Steel Mesh barrier. There are no loose components or special tools required removing the risk of falling objects during installation. This system can be vertically extended using Top extension barriers providing a guardrail height of 1800mm. We offer two anchorage options, Cast-In or Drilled- reusable. 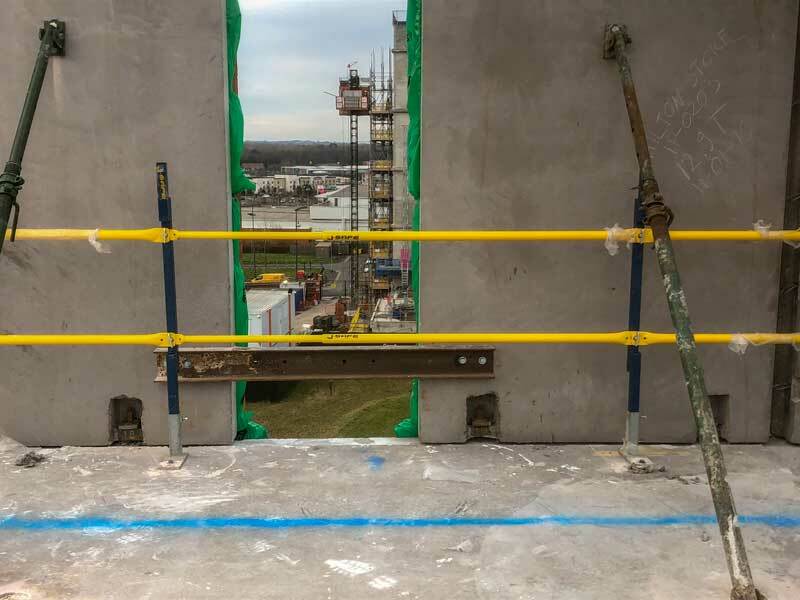 The J-SAFE Connect Cast-In Anchor is the safest and most economical method of installing a temporary edge protection system to the side of a concrete deck. The two part Cast-in Anchor is manufactured from tough plastic housing a Dwyidag threaded nut. 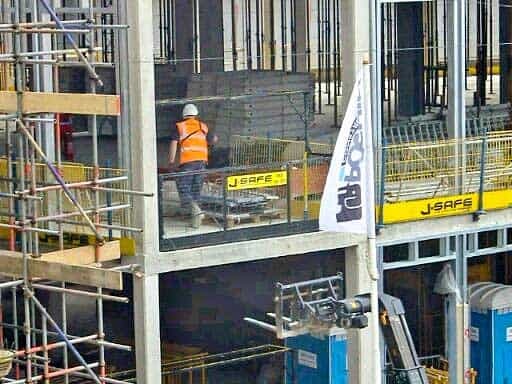 Anchorage points are planned for J-SAFE Slab edge brackets at 2.4 mtr spacings. The installer nail’s the anchor cap onto the slab edge formwork, then pushes the anchor onto the cap which is then cast into the deck. When removing formwork, the cap will pull out exposing the anchorage point into which the slab edge bracket is connected with Dwyidag rod. 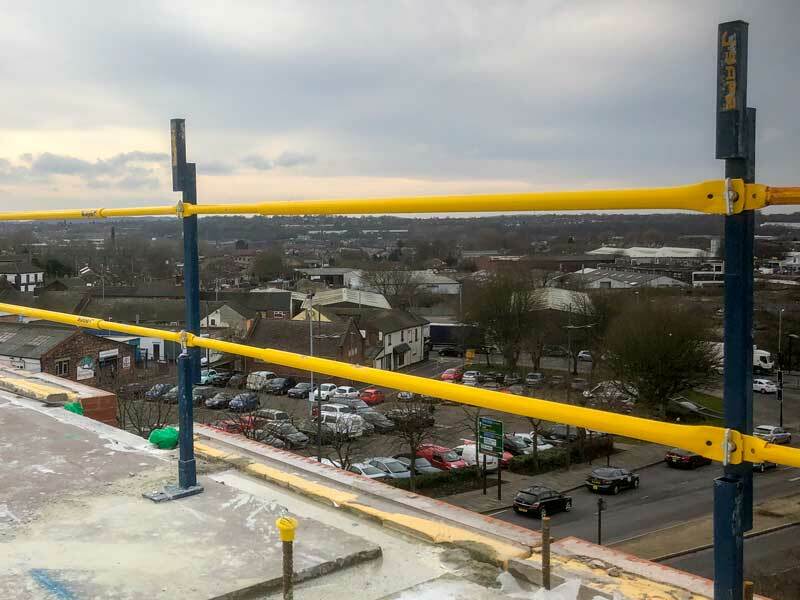 There is no need to drill concrete so edge protection will be erected faster, from the falsework access platform, which means that the installer is working behind a fixed guardrail, or collective system and avoids the need to work at height from a MEWP , access tower or ladder. An alternative fixing for attaching edge protection to the side of the slabs is the M16 Excalibur Screwbolt. These anchors are reusable up to ten times, if handled carefully.so could provide cost savings if the edge protection system is to be progressively moved. These are fixed nominally at 2.4 mtr spacings. The installer should drill the concrete from the falsework access platform working behind its guardrail to avoid working from a MEWP , access tower or ladder. 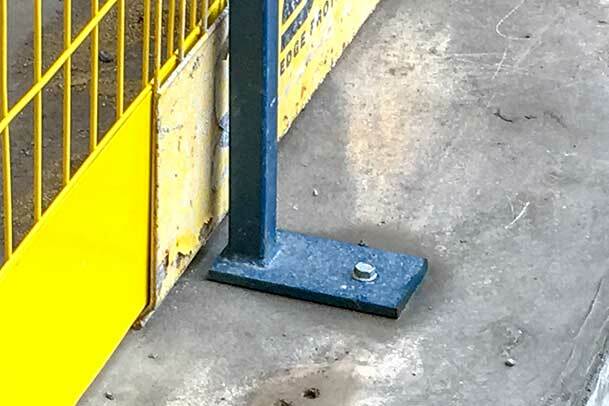 J-SAFE Connect is installed when the concrete has hardened to sufficient strength to hold an anchor, normally twenty-four hours after the pour. A 12mm diameter hole is drilled to a depth of 105mm into which the screwbolt is screwed, cutting a thread into the concrete and retaining the Connect Base and Post. Complete system of leading edge protection for any application on the perimeter of suspended concrete decks. Designed to meet and exceed BS EN 13374 the European conformity standard for temporary edge protection systems. Temporary Leading Edge Protection with Steel Mesh Barriers for Material containment to heights of 1.15mtr and 1.8 mrs.
Reusable Screwbolt anchors 12mm diameter on top of slabs. Adjustable Twin Restraint guardrails, for collective protection when Barriers are temporarily removed for access to fit external facade systems. 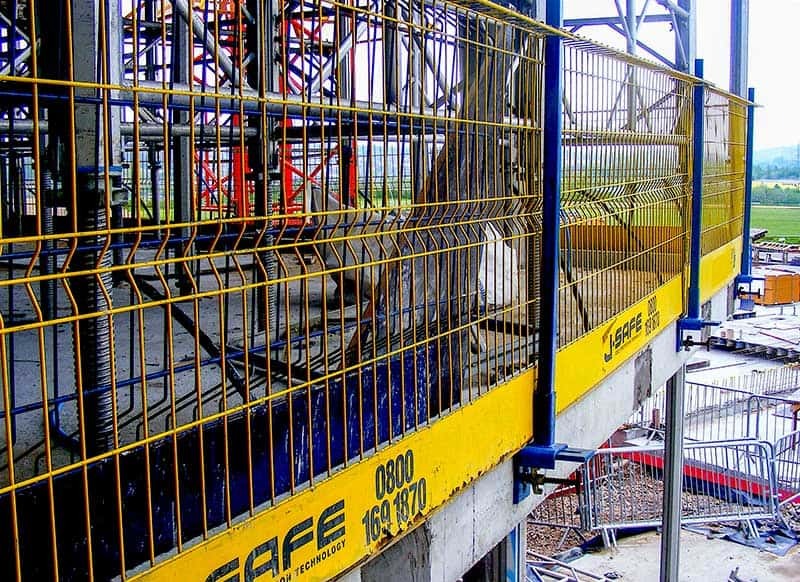 The J-SAFE Loading bay gate is a steel mesh barrier, 3 metresin length designed to allow safe and easy movement of materials into the building. It works on a pivot principle, when the front end barrier is raised, a rear twin guardrail barrier is lowered protecting those working in the area immediately behind the loading area. It has been designed to act as a collective safety measure when not in use, it is compliant with en13374 class A so replaces a temporary leading edge protection system where installed. It requires 4 x 12mm diameter screwbolts( provided ) or equivalent to fix into a concrete floor slab. Supplied with full user instructions.